The next few months flew by, and before we knew it, the day had come for departure, mum drove us to the airport, and I could tell she was worried it was her last goodbye to her youngest child and husband! I was starting to feel the same way! We met the rest of the group on the 16th April at Brisbane Airport, everyone seemed a bit nervous. We all chatted away, excitedly and nervously until the flight to Port Moresby. Flying over the mountains as we arrived in Port Moresby was daunting, even from 12000ft, they looked enormous and treacherous, but beautiful! It was hot and steamy when we landed, and we transferred to the hotel, for a quick briefing of what was to come the next day: 4am departure to get back to the airport in time to make it on our 7.30am flight to Popondetta, followed by the 4 hour truck ride to travel 76km to the start of the track… so you can imagine the quality of the roads! At 10:30am, we were still in Port Moresby… they often overbook flights, so you’re lucky to get on your actual flight. We were all in good spirits and actually a little relieved to defer the commencement of our biggest adventure ever! After a quick flight in an “interesting” plane, and our 5 hour bumpy truck ride, we had finally arrived at Kokoda! We were allocated our amazing and incredible porters, and took off for our first campsite, an “easy” 3 hour walk… I now know that there is no such thing as “easy” along that track!! It was so hot, and muddy and slippery, just a taste of what was to come. The first night, our leader was really sick, temperature, vomiting, the runs. He didn’t let on to this until the next day at lunch time, after 4 hours of hiking up a vertical hill, and so I offered him some medication from my travel kit. He was still unwell the following morning. A father and daughter pair was helicoptered out that morning, and he continued to trek on after they left. That day, we trekked for 11 hours, again, muddy, slippery, steep, hot, raining, rocky, tree roots, red mud, orange mud, deceptive mud, we discovered at least 100 different types of mud! But the scenery and the company of our delightful porters and group kept us going. The leader was up all night with high temperatures, rigors, and delirium. Needless to say, he was also choppered out, 3 people out in 2 days, to leave our trainee leader to get us the rest of the way… she was nervous, but did a fantastic job, along with our local crew. 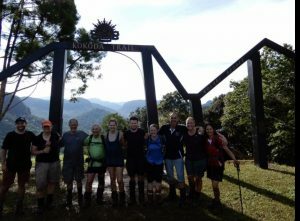 As I said, there was not one easy part of Kokoda. All the history, ANZAC Day Dawn Service at Ioribaiwa, the story of Surgeon’s Rock, the climbs, the descents, the friends made, the accomplishment, are things I will never forget and will remain with me forever, and forever be grateful for what our soldiers went through. Finishing was so emotional, it was hard to say goodbye to my beautiful porter Danny, who had my back every single step of the way. Goodbyes were hard at Brisbane Airport, when we all went our separate ways. Sleeping in past 4am was not hard though! Turns out, the leader had contracted Typhoid! He had his vaccination 18 months before, only drank bottled water and we had all eaten the same food as the rest of us… just goes to show you can never be too careful, no matter how experienced you are! If you ever get the chance, or have the desire, go and do Kokoda, but train hard!